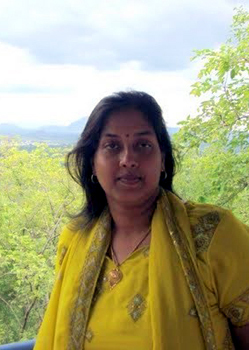 Srivalli Jetti is the author of two food related blogs, Cooking 4 all Seasons and Spice your Life . She is a software professional living in Chennai India. Srivalli believes that food is essential part of our life and very important to all of us. Thus, we should take efforts to eat a healthy diet and know what we are eating. In order to bring awareness on diet related disease, such as diabetes, she and her dad have started a section on diabetes authored by her father. They aim to get the important information of food to as many people as they come across. Beside food blogging and work she enjoys taking care of her three children. Her other interest includes painting, reading, and writing. Beside Indian food, Srivalli loves to eat various Italian pizzas and other fast foods. However, due to health reasons she is not indulging in them much these days. [Srivali] I consider cooking as the hub for the family. So in that sense I have never viewed it as a chore. It is my way of expressing my love to my family. In that sense, cooking should be simple, easy and enjoyed. If it is not simple, try making it simple! [Srivali] I have always wanted to write a book, and finally decided it would be a cookbook. With my young children, I couldn't venture into that project then. I thought I was creating history by creating a blog! :) Blogging has given me an audience to whom I can now share my cookbook, which is going to be published shortly. [Food-india]What do you hope people get out of your blog posts? [Srivali] I hope novice cooks or anybody for that matter, get to enjoy quick, simple Indian food that can be cooked for everyday dining. I hope I can enrich at least some with what I have learnt. Blogging has made the platforms flat, which gives us the unique opportunity to get exposed to new information. We should try to make the best of it. [Food-india] How did you learn to cook? [Srivali] My Mom is a great cook, I got interested seeing her effortless cooking. Plus with my family showing interest to taste and experience new dishes, we ended up trying our hands at different cuisines. Infact as in most Indian households, one learns seeing their mother and continues to learn from mother-in-law. I am lucky to have good teachers. But I started cooking only after marriage, previously it all used to be only baking cakes and pizzas. I have a huge collection of cookbooks, journals, paper cuttings. I get inspired flipping through them, though I may have covered just 1% of the recipes. [Food-india] What are some of your favorite food blogs? [Srivali] I love blogs that feature recipes interwoven with their memories. Beyond Curries is a group blog aimed at demystifying Indian Cooking. My team members' blogs are some of the finest blogs one can get to read. Indian Food Rocks, Manisha rocks with her excellent writing and satirical approach to most things, including her beautiful pictures. When my Soup came alive! Sra is an exceptionally witty writer. Her play with words just make you want to read on and on! Chef in you, Dhivya's pictures are simply too good. Her step by step detailed instructions makes me applaud her commitment. I am just naming a few, the list goes on! [Food-india]What is your favorite Indian meal to cook at home for yourself and for entertaining friends and family? [Srivali] My favorite meal would be Drumbstick sambar with Arbi Roast. Aloo Paratha (link) with curd (yogurt) and Avakayai. My other favorite meal that I can't get quite like how it is made by by MIL is Vankai Pappu (link) with Mirapakaya Bajji (link). For entertaining friends and family, I might do Nawabi Chicken Biryani (link) with my mom's signature dish X-Chicken fry (link).